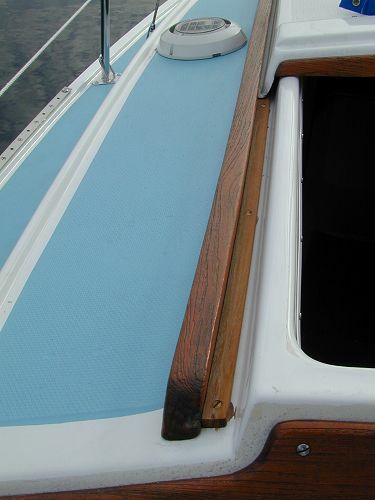 The hatch boards on my boat were notorious for leaking water into the cabin. They don't fit together very well and water would end up on and under the port side quarter berth cushion (which was practically destroyed from the years of water damage). I resealed the hatch board guides but I still had water coming into the boat. Finally my mother in law made me a snap-on hatch cover out of Sunbrella. Now my cabin is dry, my new cushions are protected, and I have sun protection for my hatch boards (which I plan to varnish someday). The compass that came with my boat was a Ritchie Helmsman. 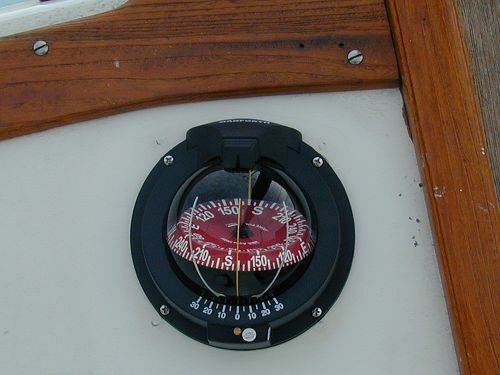 This is a good compass but it is made to be mounted vertically in the bulkhead. 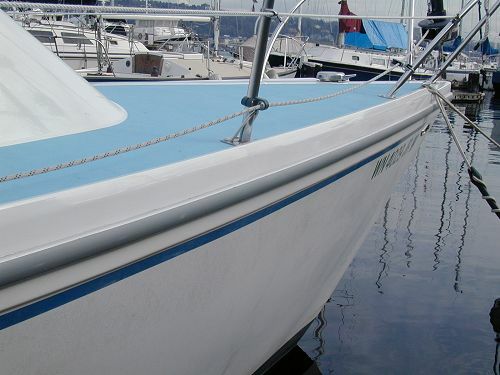 The cockpit bulkhead on Catalina 27s has about a 30 degree angle. The way my Ritchie was mounted, you couldn't see the numbers on the compass because of the internal gimbal. To get the Ritchie to the proper angle would require a fairly substantial mounting block. These are not cheap and take a lot of work to get to the proper angle. I didn't want to have the compass jutting into the cockpit and yet another piece of external wood to care for. Eventually I found the Danforth Saturn Compass. It could be mounted in the inclined bulkhead without a spacer block, was top read and side read, and had a built-in inclinometer. It was also fairly affordable at about $100. Plus, it has a really cool red LED that illuminates it at night. With the time I spent painting my deck, I was dismayed to find lots of bird poop on it every time I came back to my boat. Looking at the patterns of the poop I figured the birds were roosting on the spreader arms. I had a friend haul me aloft and I put wires above the spreader arms to keep the birds from landing. I attached the wire from the top of the spreader socket cotter pin to the shroud about 6 inches up from the end of the spreader arm. This wire seems to have kept the birds at bay. I did quite a bit of research on radar reflectors since my boat without an inboard motor is practically invisible to radar. It gets foggy in Puget Sound and I wanted to be visible. Practical Sailor seemed to think the original Davis reflector was the best available. Here you see how I have it hoisted up my port spreader arm flag halyard. Many people have mounted their reflectors from their backstay but I feel hoisting it up to the spreaders gets it higher. 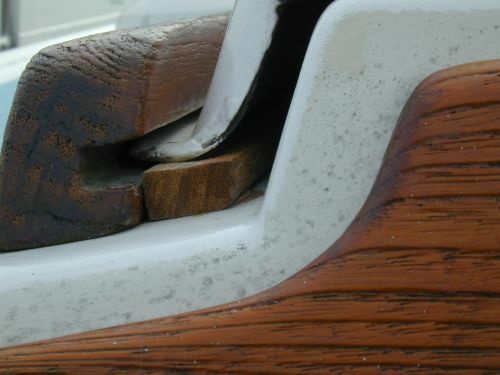 Much has been written about how the teak hatch supports really don't support the hatch very well. They only support the outer flange of the hatch putting excessive strain on it leading to cracking. Others have had new teak sliders made but I found a simple solution at my local chandlery. I bought two teak trim pieces and mounted them with screws next to the existing teak supports. As you can see from the photo the flange now sits solidly on the trim pieces. I used candle wax to lubricate the trim pieces and my hatch now slides back and forth much better. Here is another photo. This photo shows two improvements. The first is a new rub rail. I tried cleaning the old one but it was over 30 years old and showed it. For less than $100 I got new rub rail from Catalina Direct. It was a bit tricky to get on. The secret is to install it on a warm day so the plastic is more flexible. You press one side in, then kind of twist the other side in using a rocking motion. It took about an hour to do the whole boat and my thumbs were pretty sore the next day. I think it looks pretty good. The side decks of my boat are fairly narrow. I installed new stanchions that angled out a bit more to give me more room but I kept stepping on the line from my roller furler. Previously I had been using the standard Harken pulley system to run the line back to the cockpit. I found these nice stanchion fairleads at my local boat store. At $8 each, they were a bargain and I was able to run my furler line on the outside of my stanchions. This keeps my side decks clean. 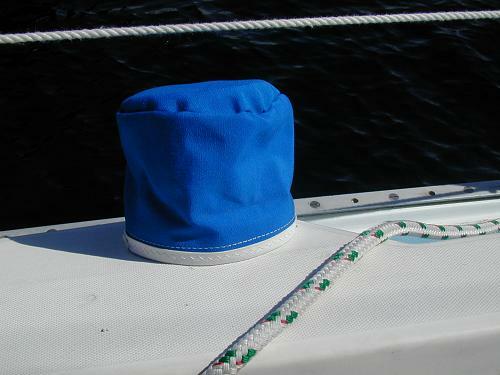 After rebuilding all the winches on my boat, I wanted to protect them from the elements. I tried to find pre-made winch covers but West Marine didn't have anything I liked. The only way I found to get winch covers was by ordering them custom. I decided I would try making them myself. 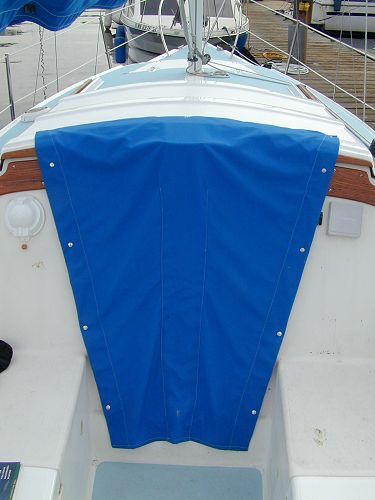 With a copy of Don Casey's Canvaswork and Sail Repair, I first bought a second-hand sewing machine, then went to a local outdoor fabric store and bought some Sunbrella. Following a pattern I found at Sailrite, I set to work on my first winch cover. Sewing is harder than it looks and it doesn't look that easy. My first cover probably took 4 hours. Much of this time was learning how my machine worked and how to do basic stitches. By the time I made my third cover, I got it down to about 40 minutes. Now my winches are covered and I know how to sew. 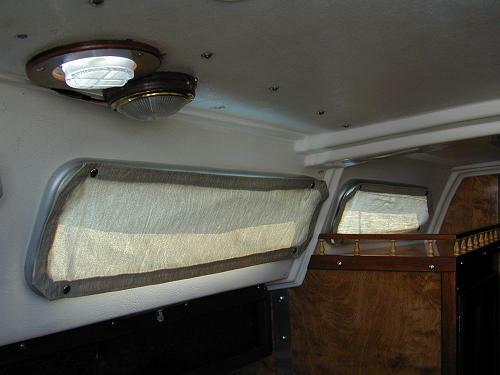 With my new sewing skills I decided I would try making some curtains for the boat. I didn't want to install curtain rods so instead, I screwed in snaps in the 4 corners of each window, then made curtains to just cover the window. Velcro sewed into the ends and stuck on the window frame holds the two end flaps of curtain to the window. When I come on board it's a quick matter to unsnap all the curtains and throw them in a drawer. Then, closing up the boat after a sail or bedding down for the night, it's easy to snap them back on. In this photo you can see my solar vent next to the dome light. A previous owner had a cast iron stove installed under the Origo stove and the smoke stack went through this hole (you can see it in the Way She Was photos.) I installed a solar powered vent in this hole and have been happy. Not only do I get a little extra light but the solar vent keeps the cabin smelling fresh. I thought a lot about this before I went with the solution you see here. Originally, C27's did not come with holding tanks. If a toilet was installed, it just emptied directly through a thru-hull. I knew I had to change this but I really didn't want to add a full holding tank system to my boat. For one, I didn't want to drill the holes in the deck and hull for a pump-out and vent, but mainly I didn't want the 'head smell' you find on so many boats. My boat has always smelled fresh because it never had a holding tank. I figured if I installed a proper tank, I probably wouldn't be able to pump it out every time it was used. Even when you do pump it out, you can't pump it dry. Either way, there would always be a little waste in the tank generating odors. I wasn't sure I would be able to completely avoid the odors since I didn't want to add multiple vents or an active aeration system. For a while I thought I would just install a porta-pottie. This would allow me to completely flush the tank after every use. But all the porta-potties seemed cheap plastic and I was concerned about their ability to hold odors in. Finally, I came up with a middle-ground solution. 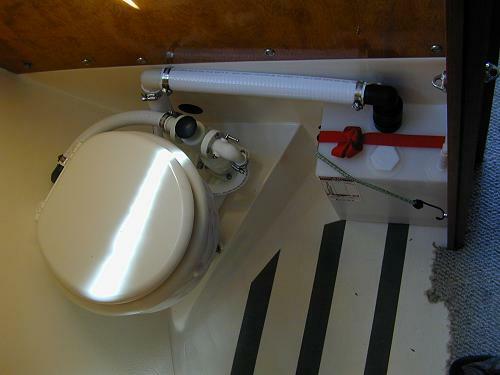 I kept my existing toilet (a Raritan Compact), closed off my thru-hull with a brass end-cap (photo) and ran the toilet outlet to a small holding tank that I could easily disconnect, and dump into a toilet ashore. It's a porta-pottie but with a nice seat and a water intake. The holding tank is the Todd 3 gallon and all the fittings are PVC. 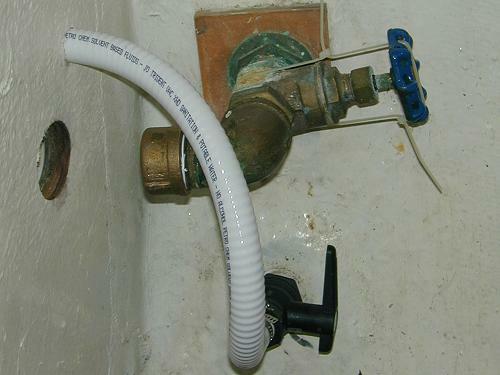 The hose from the toilet runs down at an angle to the holding tank so it drains completely when flushing. It has a fitting that presses firmly into the fitting on the holding tank. I also have covers for both pieces when I take it apart to empty. For a vent, I just have a small hose on the vent to allow air to escape when the toilet is being flushed. My philosophy about my head is that if at all possible, I (and my guests) will use the bathroom ashore. If I'm under way, or I need to go at night while anchored, or I just don't want to walk down the dock, I have access to a toilet. It can't hold much but I expect to empty it every time after it is used. I intentionally kept it small to make it easy to carry and so it would fit in the head compartment. As an added bonus, I have all the space under my seat intact and not taken up by a large holding tank. I think it will work fine for day trips and weekend trips where I have access to facilities. I will probably add a Y-valve so I can just flush overboard when I am in appropriate areas in Canada. Will it work? I'll add a report at the end of the season.